The IBM® Spectrum Scale GUI provides an easy way to configure and monitor various features that are available with the IBM Spectrum™ Scale system. It is a web application that runs on common web browsers, such as Chrome, Firefox, and Edge. The IBM Spectrum Scale™ GUI uses Java Script and Ajax technologies to enable smooth and desktop-like interfacing. 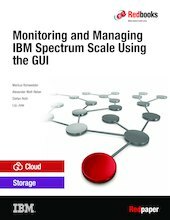 This IBM Redpaper™ publication provides a broad understanding of the architecture and features of the IBM Spectrum Scale GUI. It includes information about how to install and configure the GUI as well as in-depth information about using the GUI options. The primary audience for this paper includes both experienced and new users of IBM Spectrum Scale.